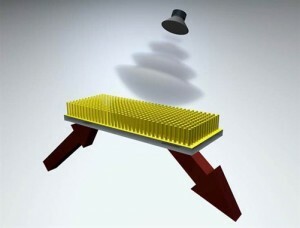 A polypyrolle compound developed by an international research team converts ultrasound waves into optical signals that can be used to produce an image. In the research study, polypyrolle, a conductive plastic, was compounded with gold nanorods, which generally are available in diameters from 10-50 nm. An optical signal transmitted into the plastics compound interacts with inbound ultrasound waves and then passes through. A specialized transducer reads the signal and converts it into an image. The research was a collaboration between Texas A&M University’s Department of Biomedical Engineering, The Queen’s University of Belfast, and the University of Massachusetts Lowell. Their findings are published in the current issue of Advanced Materials. In conventional ultrasound technology, images are generated by converting ultrasound waves into electrical signals and is constrained by bandwidth and sensitivity limitations, according to Yakovlev. As a result, high-quality images have not been available. Ultrasound is well known as looking at fetuses and is also used for diagnostic purposes in trauma inncidents and even as a means of breaking up tissue and accelerating the effects of drugs therapies.